Ever since I wrote my book, bakers have sought me out to ask me questions. What am I doing wrong with my frosting? How long do the cookies keep? What’s “meringue powder”? How do I keep the stem on the martini glass cookies from breaking? Many of your great questions are scattered in the comments throughout this blog. This post is to handily collect them all so not only will your answers be easily accessible, but others can easily find them. Have a question? Leave a comment here and I’ll be sure to answer, usually within a day. So be sure to check back! Your answer will be right beneath my name. Kathy asked “I hope you can help me find a recipe. My friend called them snowballs, they had whole hershey kiss inside and were covered with powdered sugar. I think they were like a butter cookie. When she baked them the kiss kept it’s shape”: I’ve never made these myself, but I found a few recipes that might match. (click the links to go to the recipes). Hope this helps!! 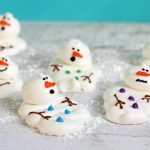 —snowball cookies at she bakes and she cooks. —snowball cookies (with brandy) at cooks.com. —a chocolate version from betty crocker. megan asked “I decorated sugar cookies this weekend using royal icing to pipe the outline and thinned the icing with some water to flood the rest of the cookie. However, after the cookies dried I noticed they appeared to have a hazy or crystallized finish, most obvious with the black and purple icing.” It’s hard to tell without seeing it. Traditional royal icing in theory dries shiny, though almost across the board (especially with my recipe, where other ingredients are added), if left to dry overnight, the icing will have a sort of matte finish. The crystallizing is hard to picture, but it leads me to believe it’s more than just a matte finish, and something that appears just wrong. Darker colors like black and purple are probably more obvious as they will show more imperfections, and you usually need a lot of coloring to make a deep black and purple. Hence, more liquid added. It could be your icing is separating a bit. Almost always the culprit here is too much water in the thinned icing. I actually thin my flooded icing thicker than most people do. While the icing doesn’t have stiff lines and will fall into itself, I keep it thick enough that you usually have to encourage it to flood a bit. The more water you add, the riskier in my view. But then, I’m a control freak! The thicker the frosting, the more I can control it. Could be that your icing has too much water (worsened by greater amounts of coloring) and when drying, the water caused some problems. Also, are you letting them dry at room temp, uncovered overnight? And whipping your meringue powder long enough that stiff peaks form and it looks snowy? Joan wondered about the huge issue of drying (and the inconvenience when cookies take so long to fully dry). How to they teach classes and have kids take cookies home that are wet? I’m afraid my answer won’t help you sleep. There is no way to speed dry cookies. Maybe with fans you can encourage drying enough to handle in a couple of hours, but you still need to use caution. The store where I worked participated in many festivals with kid-cookie-decorating booths (and not on sticks). Kids decorated, then walked away with wet cookies on napkins or plates. Most ate theirs almost immediately. Plates, boxes, any container where you don’t have to touch the cookie is the way to go. Or perhaps in some of these classes they request the students pick up their cookies the next day? That’s what I would do if hosting a class, especially with cookie bouquets (I wait at least overnight before assembling a cookie bouquet), so spreading a class over two days would ideal. Transporting dry cookies is infinitely easier and like I said, no shortcuts to drying. What I often do when I need to store/transport wet cookies is place them in underbed storage boxes. A baking tray fits almost exactly, so you don’t even have to take the cookies off the tray, and it has a lid. This isn’t apt for classes, but just a tip for your own use! Andrina had a problem with the edible markers, the ink sank right into the icing when left overnight. I’m about 98 percent sure it’s the icing, not the markers. Yes. Humidity will affect the icing drying. You should use a bit less water in your royal icing to help speed the drying, and let the icing dry overnight at least (or 2 nights) to totally harden before you use the markers. You don’t need to let the markers dry overnight, maybe a couple hours if you are packaging them, but it’s more important to let the icing be totally dry. You should be able to press on the icing with your finger without any indentation at all before pulling out the markers. Lots of readers have also had drying issues, and I include tons of tips in some of the answers below about things to do to encourage drying, but the most important things to do: let cookies topped with flooded icing sit out a couple nights, put fans on the cookies in hot and humid climates, use less water in the flooding icing, for sure, and always wait until the icing is totally solid before using the markers. For that reason, it’s best to use a royal icing (the recipe on my blog works) and NOT buttercream, which never fully hardens. All that should help! mom and son minus one asked about black frosting coloring turning mouths black. Is there a solution? I’m afraid not. This is absolutely normal, particularly with blues and red-based food coloring, like black. And especially when you need a load of coloring to turn frosting a deep shade. I remember once at the store where I worked, we had an irate customer who was horrified that the food coloring had such an effect and worked very hard to convince us there were alternatives to tinting frosting than using coloring. While fruits and vegetables can be used in some cases, to get the deep colors needed for the more unique designs, like music notes, it’s food coloring. And it stains. Just as when you have a sno-cone, or lollipop, your tongue turns the same shade. As a cookie decorator, I walked around with stained hands permanently (and still frequently, for a day or two after kneading coloring into fondant). That being said, you can certainly try natural food coloring, such as THESE HERE. I’ve not tried them, and can’t give an expert opinion on them, but I would imagine natural is less apt to stain. I use Americolor soft gel pastes, and while dark colors will most certainly stain, I’ve not had as dramatic a result as you describe, so maybe a higher quality paste is the way to go, too. But in the end, you did nothing wrong. ‘Tis the way it is! Though you may sacrifice the design, you can always opt for light colors when all else fails, or find ways to use very dark colors and blues (which can turn you into a Smurf with their staining powers) sparingly and hope that the consumers of the cookies are understanding! 1. choose your container first, then choose styrofoam that fits tightly in the chosen container (chip away edges if needed, or wrap the styrofoam in colorful tissue paper to really get it in there tightly). Fit the styrofoam first, then put the decorated cookies on a stick in the styrofoam. 2. don’t try this with large cookies. Stick with smaller cutters, in the 3-4 inch range. Those large copper cutters (5-8 inches) may work, but will be less stable. 4. 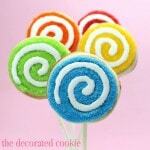 If desired, put cookies on varying levels of lollipop sticks so you can arrange them at different heights. 6. you might want to bake the cookies a couple minutes longer than usual to make sure they aren’t soft at all in the middle. 7. Use extra care when handling/moving the arrangement if traveling with it. You may want to put the whole thing in an open box until you give it to the recipient. 8. Also a good idea to just make a couple extra of each design in case of breakage, if that’s possible. —day one: mix a batch or two of dough and put the unbaked dough in fridge. —day one or two: mix a batch of frosting. If time, I’ll make all of my colors and prepare my frosting bags. —day two or three: take the dough out of the fridge, let soften at room temp. a bit until still chilled but pliable, then roll out and bake cookies. And I’ll leave you with one more thought. For my book, I decorated hundreds of cookies. In my home kitchen. On 12 inches of counterspace! I did lots and lots of prep like this 🙂 or I would’ve gone completely mad. serena said this: “Your cookie dough is great to work with as it keeps its shape well from cutting to baking. The cookie is lovely and crisp if unfrosted but once frosted it becomes soft. Is there any way to maintain the crispness?” Hmmm, not sure that there is. You may cook your cookies a bit longer than mine (unless you’re referring to the chocolate, which I do cook pretty crisp), as the regular sugar dough tends to be consistently soft-ish for me unfrosted or not. I’m afraid the moisture from the frosting is the culprit in your case. Not sure that it’s solvable, but some things you might want to try…. 1. make a thicker frosting. If you have too much water in the frosting, that will certainly soften. You can generally use a thicker (as in, more confectioner’s sugar) frosting than you think. You can still flood the cookies, just move it around with a knife more than letting it flood on it’s own. 2. 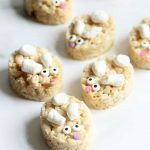 You can try spreading a thin layer of light corn syrup on the cookies before decorating to form a barrier, though I’ve not tried this, and I would test one first. Could make for an overly sweet cookie. 3. You can pipe a design on the bare cookie with a thicker frosting and simply leave the background unfrosted. That way, you’ll still get some sugary taste but leave some crispy part. I hope this helps! Thanks for your great question! MissNekoChan asked about linking to her blog (check out her blog HERE), which is inspiring me to make a whole post about linking and press and building your blog (thanks Cat! I’ll hope to put a post up soon). I’ve been slowing down my blog roll and usually only link to blogs after I develop a relationship with them (as in, we chat over email quite a bit and we post on each other’s work). 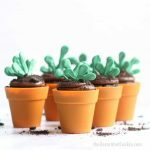 BUT the best way for me to help giving exposure to other blogs is through my column, edible crafts. The readership is much higher and you have a whole feature which drives traffic to your blog. You can submit posts HERE for consideration. You should check out some of my prior posts to see the kind of stuff I accept. I usually favor posts that have good photos and definitely how-tos included. I also rarely post on straight baking, but on goods that have an artistic feel to them. So for example, your Easter sugar eggs would be perfect. If you post the tutorial or a recipe, be sure to send it to me! Autumn in Philly asked about St. Patrick’s Day ideas, and turning the gingerbread man into a Leprechaun (as I did with the mummy HERE). I was juuuust thinking yesterday that I need to get some St. P’s ideas up ASAP! I have got get on that, and will try and have something by the end of the weekend. I’ve done hundreds of man-turned-leprechauns over the years when working as a cookie decorator, and of course, no pictures. If you go to the site where I used to work, Bundles of Cookies, and click “Arrangements,” then “Themes”, then “St. Patrick’s Day,” they have a couple arrangements with St. P’s ideas…but I will get working 🙂 !! Heather (aka Auntie) asked if I’ve ever used the gourmet writers with a rubber stamp to transfer an image to fondant. And my answer is, why no, I’ve never heard of that and I’m going to look into it immediately! (hold on… OK, I’m back) Looks like you just use regular old rubber stamps (I assume new, clean ones) and use the marker on them? Methinks I shall try this! Thanks, Heather, for the suggestion! 1. make sure when whipping your meringue powder and water you whip it VERY well. A few minutes. It should look like snow. 2. For frosting colors, try soft gel pastes (I like Americolor brand, you can see their site for info where to buy, though I’m guessing if you use the term “icing sugar” which we call powdered or confectioner’s sugar here, you’re not in the US? I would search for “soft gel pastes” where you are and hopefully there are comparable brands). Always tint “white” with white coloring, too, never use just the plain frosting for white. But the coloring you’re using can make a big difference. 3. Your frosting may be too watery. Are you flooding with icing? If so, try not making it soooo runny (add a lot more confectioner’s sugar). If it’s more like a thick glue, you may have to encourage the flooding with the back of a spoon to get it to the edges, but it will dry much better and without holes. While you see the lines more, I often don’t flood at all and just pipe the whole cookie with a thicker icing. 4. Always let the cookies dry one to two days fully, uncovered, at room temp, and if it is hot or humid, run fans on the cookies. I hope this helps! A lot of it is trial and error. I think the biggest suggestions are 1. make the frosting thicker and 2. run fans if it’s hot. serena asked: I live in Singapore where it is very humid all year round. Do you have any tips for making the sugar cookie dough easier to work with? And the icing tends to take very long to set. Should i make it thicker? We had the same problem at the store in summer. Ovens running all day long, the humidity through the door, hundreds of cookies on the rack… Made things difficult. Chill dough VERY well before using it. I’d refrigerate it at least 2 hours, or even 3, before rolling it out. Work with small amounts, keeping unused dough in the fridge while you work. As for the icing, thin icing does take longer to dry, although too thick will make it difficult to get out of the frosting bag, so use caution with thickening. Sugar cookies last longer freshness-wise than drop cookies, so it’s OK to let them sit for up to two days to dry. We used to keep fans blowing on the cookies and that helped tremendously. anonymous asked: “how you stick the photographies to the cookies. I make with paper(role) of sugar and with paper(role) of wafer and not as(like) stick these you finalize? Do you use royal(real) ice for the base? And you do not stop to dry and put the image?” Hmmm, I’ve not used photograph or wafer paper on cookies before, so I hope I can help. I have used transfer sheets, but I use melted candy or chocolate, not royal icing. (For directions on how I used the transfer sheets, CLICK HERE). However, you should be able to find help at Fancy Flours. They are wonderful and I believe they have the product you are using. If you CLICK HERE, you’ll find a tutorial on making wafer paper cookies (is this the product you use?). They let the royal icing dry overnight and use a clear edible gel to adhere. They also say you can use a thin layer of light corn syrup. Now you’ve inspired me to try this! cat asked “If I was to add more water in the icing recipe, would that make the icing smoother and not show lines, yet dry just the same?” Referring to the recipes I have on the blog HERE, yes! You can add water to the frosting to thin and confectioner’s sugar to thicken. The frosting recipe here is a middle-of-the-road thickness. I often use it for both outlining and filling. But you can also use it for flooding. Outline with the frosting (you can thicken if desired, but this recipe should work fine for the outline), let set about 15 minutes, then in a bowl, thin some of the same color frosting with a few drops of water at a time until it’s about the consistency of glue. Then use a small spoon or squeeze bottle to fill the cookie. autumn in philly asked about how to decorate the mummy cookie, as seen in my book. This is such a timely question, I devoted a whole post to answer! Thought the graveyard scene might be inspiring this time of year. Thanks for reminding me I have the Halloween scene in the book! See the mummy how-tos HERE. serena asked: “6-8 hours after white icing dries, yellow patches start to form on the icing. I suspect it’s the ‘oil’ from the cookie seeping into the icing.” hmmm, I’ve not encountered this problem before, so I wonder if I’d be able to help. I do have grease from cookies, even 2 days out, as is apparent if left on paper. But I don’t have the yellow patches into the icing, even if the decorated cookies are left for many days. I wonder if it’s in the icing. Are you using a store-bought white icing? Or do you use butter cream instead of a royal icing? To decorate with white, I use my recipe HERE (never fails me) and I always, always, always tint the frosting with white food coloring, specifically, Americolor bright white soft gel paste. It takes a lot of coloring, too, to get a pure white. 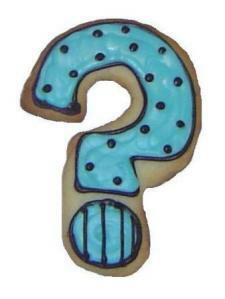 Are you using margarine in either the cookie dough or the icing? I wonder if that can do it too. UPDATE to Serena: It seems counterintuitive to add white coloring to frosting that already looks white, but I would guess that’s the issue. Adding white dye is a must must must! Hope that works! Little Ducky asked about powdered food coloring, as in adding orange to a cake mix gift. What a super cute gift idea. I have never worked with powdered food coloring, but I see your dilemma. In theory, you should be able to add it to the mix, then when the recipient bakes the cookies, they will be orange, but I would definitely test a batch first. I know this can be wasteful, but my fears would be that the coloring wouldn’t work as well as liquid in tinting dough, or that the cake mix itself wouldn’t be orange (hence, you’d have to explain any odd coloring or let the recipient know the batter will be orange when mixed with eggs or the liquid). If testing doesn’t produce the results you’re looking for, you can also include a small bottle of orange colored concentrated paste food coloring or (what I prefer) soft gel paste food coloring. Then, once the batter is mixed, they add a few drops of coloring. Hope this helps! I wish I had powdered food color experience. If you experiment, I’d love to hear about the results! For the icing: meringue powder, confectioner’s sugar (as opposed to granulated, you must use confectioner’s, also known as powdered or 10X), vanilla extract, Crisco or a similar vegetable shortening. 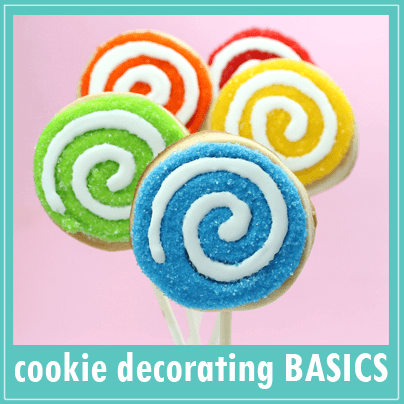 For decorating: 12-inch disposable decorating bags , standard couplers, decorating tips (Wilton is the best, simple round tips numbers 2 through 6 are what I use, I don’t use fancy star tips or 3-D tips for cookies), rubber bands, soft gel pastes food coloring. All of these items, except for the gel pastes, can be found at any major craft store here in the U.S., like Michaels. 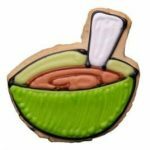 I linked some of the above to items on the Wilton.com web site so you can see exactly what they look like, though not sure if they ship internationally. Craft stores DO sell concentrated paste food colors, that are also quite good, but they taste sort of funny. The soft gel pastes are harder to find, but I use Americolor brand. 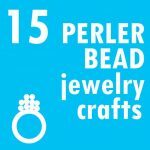 Their site has links on where to buy. Hope this helps! Good luck! kay asked how long the cookies are good in the freezer, if the icing consistency is changed, and a thawing method: When making tons of cookies, freezing is inevitable. Or, when only making a few and when you have leftover dough, also inevitable. I’ve had VERY good luck freezing my cookies, both the raw dough and finished cookies, with the icing recipe I have on this site (HERE). Things I freeze, when sealed well in freezer storage bags: the unbaked cookie dough, cut out and baked but undecorated cookies, and the finished decorated cookies (fully dry at room temp overnight before freezing). All of the above can be frozen for several months. I’ve really noticed no difference in consistencies, though sometimes the icing colors can bleed a bit, especially black and red-based colors, so make sure the cookies are fully dry before freezing. To thaw, leave in their sealed bags at room temp for at least an hour, or until fully thawed. Removing from the bags too early causes sweating and can damage the cookies. If you are making cookies for an important event and need to freeze, best to do a dry run with a couple to make sure all looks well. But again, I’ve had great luck with freezing. No one can tell the difference. tracy mentioned the difficulty in finding supplies in the UK. I’m a total Anglophile and dream of living in England (I spent a few months at Oxford, but it didn’t satisfy the craving), but I do admit I would miss the accessibility of so many craft stores and cake decorating supply stores. I know I came across a super-cute online UK-based shop but I can’t find it in my bookmarks. I’ll keep searching. The shops I did find are cakes cutters and crafts shop, cake-links, and cake craft shop, though I know online ordering isn’t quite the same as being able to browse for products in a shop. Are there any major craft stores, not necessarily cake decorating stores? A lot of time the big shops have an aisle with cake decorating wares. noor asked how long decorated cookies keep, as she’s making at least 3000 for her wedding 6 months away. And I was impressed by myself for making all the cookies for my wedding and getting them to Vegas. And I had a mere 75 guests! Bravo for you. Starting now is wise. The cookies themselves last up to a week, and making 3000 cookies a week before your wedding is unrealistic, so you will most definitely have to freeze. We’ve had orders upwards of 10,000 cookies at the store, and even with a staff, we had to work ahead of time and freeze. Some freezing tips: Let cookies dry completely, at least 2 days (for this reason, you’ll need to use a royal icing, not buttercream). Wrap individually in cello bags and stack tightly in another sealed bag. To thaw, remove from freezer and let thaw completely before removing from the sealed bag. The dough can also be frozen and thawed until pliable in the fridge. The recipes I use on my site freeze very well, but I would also suggest a trial run of freezing/thawing to make sure it works for your design. Some vibrant colors are at risk of running. Hope this helps, and keep us updated if you can!! Soleil has been searching for a recipe for an icing that dries rock hard and is shiny. If the icing was rock hard, it was almost certainly a traditional royal icing. The recipe I have on my site for royal icing has shortening to soften it just a bit (so it dries enough to handle, but has a bit of softness for taste), but traditionally, royal icing is just confectioner’s sugar and egg whites. In some cases, just confectioner’s sugar and water. You can google a lot of versions of royal icing, some including milk, lemon juice and extracts. A basic recipe: Whip 4 Tblsp meringue powder with 1/2 cup cold water VERY well, until stiff peaks form and it’s fluffy. Add 4 cups or more (depending on how stiff you need your icing) of confectioner’s sugar and blend. You can also substitute 3 egg whites and 1/2 tsp. cream of tartar (a stabilizer) for the meringue powder/water combo. Hope this helps! Sorry I couldn’t offer a more definitive answer! Katie asked about substituting egg whites for meringue powder, as meringue powder is hard to find in NYC (ie places without a Michaels or other craft store handy): Traditional royal icing is made with real egg whites, so you can substitute. I would substitute 2 large egg whites, making sure your bowl is REALLY clean to start and make sure you whip it very well. Meringue powder is so much more user friendly than egg whites, which is why I rely so heavily on it. And meringue powder doesn’t need refrigeration, so the recipe for frosting I have on this site lasts a couple months at room temperature. Great when you have leftover colors. I understand the angst of living in a major city and not having chain craft stores available. I live in Washington DC and have to drive at least 30 minutes for a Michaels run. But you should still have a couple NYC options. Sur la Table is a chain store, and they have a shop in SoHo (see surlatable.com, search for NYC and you can call first). They should carry meringue powder. There should also some independent chef’s level cake decorating shops that carry the stuff, though that might take more digging. And if time allows, there are internet resources that ship. 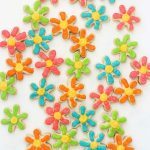 Some I’ve used: sugarcraft.com, cookiecutter.com, candylandcrafts.com. Hope that helps! Anonymous asked about how to transport cookies, especially with little bits that break off: This was always a challenge for us at the store. Imagine shipping 100s of cookies across the country in one piece for a wedding! Ugh… no small thing. A few tips: 1. Let cookies dry at least a day, wrap them individually in cello bags, then pack. 2. I tend to bake cookies a bit thicker and for a few extra minutes if transporting. Makes them more solid (as long as you’re sure they bake through the center). 3. To transport when not shipping: Line a large FLAT tupperware or box container with bubble wrap, then lay cookies in a flat, single layer and top with another sheet of bubble wrap for the next layer of cookies. this of course only works with totally dry and wrapped cookies (see number 1) You can also put packing peanuts in between the little pieces. 4. To transport many cookies, do the same as in step 3 with the bubble on the bottom, but stack cookies on their side tightly in a row. Believe it or not, this works. I actually ship this way.) 5. When shipping, do the same, but pack very tightly, with popcorn in all the tiny parts. You should be able to shake your packed box and hear nothing rattling. 6. Bake extra. You will always lose a few delicate cookie pieces, so always bake extra. 7. Basically…loose packing, jostling, and cookies bumping each other cause breakage, so take precautions against that: use bubble wrap, peanuts, tight stacking, flat containers, DRY wrapped cookies. I was wondering why your cookie recipe doesn’t contain baking powder? (from Anonymous) I may get some of the science wrong here, so forgive me… Yes. 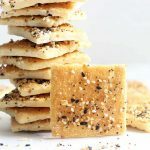 My recipe for “sugar” cookies that I post here is really a “shortbread” cookie. I have no aversion to leavening agents, by any means. The recipe in my book is a true sugar cookie and does contain baking powder. But I still keep coming back to this one here simply because it works so flawlessly for me. The pros of a traditional sugar cookie are that they do taste lighter (as the baking powder is responsible for some sort of bubble and air type scenario), and a shortbread cookie is denser. Not as pleasing to many. And sugar cookies with higher flour content can hold their shape well enough to take a cutter. But I’ve always struggled to get sugar cookies from maintaining the exact shape of their pre-baked state. The shortbread recipe does this. It’s almost exactly the same size, and you can bake it thicker to accommodate lollipop sticks and it still cooks evenly in the middle. So to recap: If you have a traditional sugar cookie recipe that works well for you, by all means keep using it! I use a shortbread recipe for decorated cookies because they maintain their shape so perfectly. (And I personally like the taste better.) Thank you! The cookies are ideal made 2-3 days ahead of time. You have to make them at least 1-2 days ahead if wrapping, as the cookies need to sit overnight to dry. (I never ever ever ever make, decorate and give cookies the same day. Never ever ever.) But they will last up to 5 days. I break things down like so: Day 1, make and color the frosting, prep the frosting bags. As frosting–royal icing, that is, not buttercream, as buttercream has a much shorter shelf life–will last a month and is one of the most time-consuming parts of the process, doing this a few days out leaves you more time for decorating cookies closer to the event. Day 2, mix dough and bake cookies. If time, decorate on Day 2. If not, decorate on Day 3. Let sit overnight and wrap on Day 4. (Or even Day 5.) If you prep the frosting ahead of time, you should be able to decorate all 48 in one day if you through and outline all, fill all, etc. As for the frosting, others have mentioned the separation issue. I wish I knew more about chemistry, because I’m not entirely sure why this happens. I always have wonderful results with the frosting, so just to make sure the frosting mixes perfectly: First, find the recipe HERE. Use cold water and meringue powder (not real egg whites, find the powder in craft stores) in a clean bowl and beat on high VERY well…several minutes at least. The mixture should be white, fluffy and with peaks. This is vital, and I believe here is where future separation problems occur. So make sure your meringue is perfect!!! Then stir in, on low, the powdered sugar–a lot of it, like 6 cups–vanilla extract, and about 2 Tblsp Crisco. If you have separation issues, don’t use the full amount of Crisco. You can cut the shortening out (many think the shortening causes the separating, but since you have that problem when not using shortening, leads me to believe it’s in the first step) , but it helps with the taste and consistency. Blend well. Heat does affect the frosting, so you don’t need to refrigerate it, but don’t put it by a heat source. 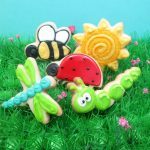 You should be able to make 48 cookies with 2 batches of dough and 1 batch of frosting, but depending on the size of the cutters–and any inevitable errors–prepare to make more just in case. As for storage, after I decorate, I spread the cookies in one layer in parchment-paper-lined tupperware. A plastic underbed shoe storage container works perfectly. You can decorate on a baking tray and put the whole baking tray in the container. I cover and let dry overnight at room temp. You don’t need to cover overnight to dry, and the cookies will likely dry better NOT covered, but I cover because I have cats. When dry, wrap in cello bags and give out. Hi Meaghan! I absolutely love your book. I began decorating cookies about a year ago and then came across your book recently and have used it for much inspiration. I do have a few questions though. I am doing about 48 cookies for teacher appreciation week at a school in a few weeks. Since I am the only one decorating the cookies I will need to work on them the weekend before. How long do the cookies last and still taste very fresh? Also, how should I store them until they are ready to go to the school? I am so fearful that they will not be fresh and cute like they are the day I make them. Any advice would be much appreciated! Sorry, one other question. I haven’t tried your royal icing yet with vegetable shortening but I plan on trying that soon. In the mean time I use pretty much the same recipe but without the shortening or the cream of tartar. I have found that I have to mix and use the day of decorating otherwise it seperates horribly. I noticed in your book that you said the icing can be stored unrefridgerated for a month. How do you keep it from separating? Is it the shortening that binds it all together? Thank you again! Wow Meaghan thank you for such a quick and detailed response!! I can’t tell you how much I appreciate your feedback. I plan on playing around with my cookies this weekend and I am going to try your icing. I will definitely let you know how things turn out. Hopefully all will go well and I will be a happy cookie decorator! Again, thank you from the bottom of my heart! 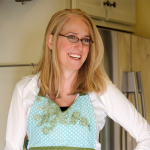 Hi – I was wondering why your cookie recipe doesn’t contain baking powder? I haven’t tried the recipe yet, but was surprised by this. Thanks! I’m having trouble transporting my decorated cookies without having them crack…especially if they have thin pieces such as claws, tails, ears, etc. Any suggestions? hi Meaghan,im planning to bake & decorate my own cookies for my wedding favour,it will be 6 months to go and i will definitely have to bake at least 3000 on my own!so the question is, how long can i keep decorated cookies as im planning to start baking& decorating this month..tq so much! I had a problem with my icing after it dried on my cut outs. Instead of drying a nice color they dried with white blotches. Is it the powdered sugar I am using? Should I only be using Domino 10X? Thanks! You said in one of your posts that you prepare your icing on day 1-2 and decorate on day 3-4, doesnt your icing go watery? If so how do you sort that out without having to empty the bag and remixing it. Hi Mary! I do, and I’ve heard of the separation problem people sometimes have. For some reason, it takes weeks for my icing to start to separate. It could be because I add shortening and light corn syrup to the icing and that helps it stay together? Or because I make my frosting relatively thick, thicker than flooding consistency. But I’ve had great luck with this recipe NOT separating. Hope this helps!! Today I made Roslyn smiley face cookies recipe. I’ve made it before with royal icing but tried the recipes dipping icing for a change. After only a few hours of drying the icing began to sweat. Any ideas why? I live in Maine but it’s not really hot or humid yet. I do have a nice cross breeze from my windows being open. I’ve placed the cookies in single layer freezer bags and placed in the fridge…? I was hoping to bring them in as a treat for work Monday but am now worried I did something wrong to make the oil separate. I’d appreciate any thoughts you may have! Thanks in advance! I Alyssa, I’m not sure I’m familiar with the Roslyn recipe. What are the icing ingredients? Is it a royal icing? Or does is it butter-based? Hmmm…. sweating is something I’ve not experienced. Is it moisture gathering on the top? or is it more like splotches? Often, when icing is too thin, the water content can seep into the cookies and cause splotching. Or, if the cookies are underbaked, the fats from the cookies can cause the icing to start splotching. Changes in temperature will cause the sweating, but usually going from cold (the fridge or freezer) to room temperature can cause condensation. Hi Alisha, Definitely shouldn’t be after 11 hours, you’re right. My guess is there is too much water in the icing or the cookies are underbaked. Could either of those be the culprit? Also, very hot or humid climates can prevent drying. You can put a fan on the cookies to help dry them. Is this for the royal icing recipe? I used glycerin for the first time in my royal icing. They were brown football cookies. After they dried, there were spots that appeared on the cookies. Could this have been from the glucerin. I used 1 tsp glycerin on a 2-lb recipe of icing. Hi! I made ricotta cookies for the first time and the recipe had them being iced (confectioner’s sugar, almond extract, and milk). The recipe said to spoon the icing over the warm cookies…to save time I quickly dipped each cookie and topped with sprinkles. They looked great. But then later the icing appeared to sweat. Thinking it was a “too warm in the kitchen” problem I put them in the frig thinking the cold would re-harden the icing. But the cookies are still sweaty/gooey and while the cookie itself is tasty the sweaty icing makes it gross in appearance and handling. Any ideas why the icing didn’t remain set/hard like it did after the cookie cooled? Hmmm… I’ve not tried icing with ricotta cookies, but my guess would be at that point the moisture from the cookies would have already mixed in with the icing. Also, the addition of milk to the icing will make it “set” but not set as well as a traditional royal icing. It could be next time to try and cook the cookies a little longer so they are less soft? Hello I made sugar cookies with that powder sugar frosting and when they were dry I wrote on them with the edible markers and the next day it looked like it ran just all over the cookies. I made the cookies and decorated them the same day. Hi Sahra, Even if the icing is dry to the touch, you MUST let the cookies dry overnight. They need at least 8 hours to be fully dry or the moisture will seep up and mix with the food pens. Hi. I’m making sugar cookies for seniors living in a memory care facility to decorate. I was planning on covering the cookies with icing (flooding), and then just have them decorate on top of the dried icing. Do you know of a way that they could add sugar or sprinkles to the dried royal icing? Great question Helen! You cooooould let the flooding set just a bit and add them, OR you could pipe a dab of frosting to adhere a sprinkle that is on the larger side, OR you could use a paint brush and some light corn syrup and use the light corn syrup as glue. Hi there! Im making oreo cookies dipped in icing for my daughters pre school holloween event. I did one cookie only for now just to see how it went. Well…. this icing I bought is too sweet! Is there anyway I can make it less sweet? I bought great value cookie icing from walmart.. the only orange icing I could find last minute. Thank you! Hi Erica! Ah, I know what you mean, especially when you’re dipping an already sweet Oreo into more icing! Really, the only way to make icing less sweet (it won’t make it significantly less sweet, only less cloying) is by adding a pinch of salt. I often add a pinch of salt to all of my icing and frosting recipes just for this reason.